Get instant access to the ultimate guide to getting more leads, sales and customers using the power of high-traffic social media sites...this guide will show you how to use twitter, google+, facebook, youtube and linkedin to propel your business! Are you caught in a constant struggle to generate more leads and sales? Are you fed up with paying expensive advertising cost like pay-per-click and not getting results? How would you like to discover a simple plan that you can follow which can bring to you more customers, no matter what business you're in? ... and best of all, it's easy to follow! A complete, no holds barred, step-by-step guide to using social media for your business in the least amount of time. I'll show you what to do and how to do it. You'll discover what social media is and how to use it to create social buzz so people can spread the word about your products/services or business in general. How to convert leads into sales in social media. Learn the 3 stages to make the most out of your social media platforms and calculate your return on investment. 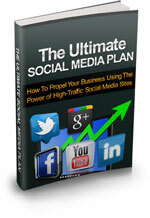 How to develop a winning social media marketing plan. How to setup and manage a Facebook Page that works. What is is? Why use it? Setting it all up, configuring and optimizing, engaging your customers + more. How to Tweet your way to online prominence using Twitter.com - Why use it? How to build and attract followers + more. LinkedIn strategies to build your network. How to use Google+ to expand your circle. What is Google+ and why use it? YouTube social media plan. Why use it? Thought leadership and expertise. Marketing and advertising and how to optimize your YouTube Videos to get more traffic to your websites.